Another investing season has begun, it’s the perfect time of the year to plan for effective management of your personal funds. Financial planning i.e. 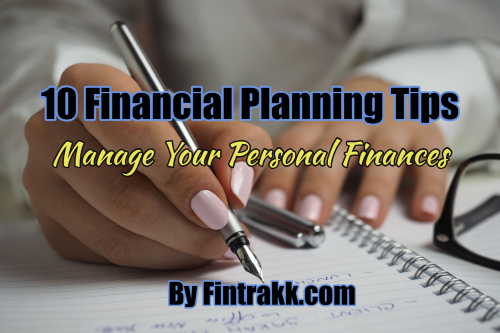 planning your finances as the name itself suggests, is the most important factor in our lives. But, we often tend to ignore it or usually don’t pay much attention or don’t have enough time to manage it effectively. Knowing exclusive financial planning tips or personal finance tips is an added advantage, not to be missed out. Whether we took the right decisions during the previous year for our Savings and Investments? What was our Investment criteria based upon? Did we prefer Short term or long term returns? Based on the above what should be our future investments? How should we do our financial planning? How wisely can we manage our portfolio in the upcoming years? Hence, one needs to follow prudent financial planning tips so that he can manage his personal funds to yield better and more fruitful returns. It is just that you need to set certain financial goals for yourself. Follow a disciplined approach so that your investments tend to be more rewarding and you can get the maximum out of it. This is a prerequisite for any investor to help you in the long run. You should set aside a fixed monthly budget to meet your basic needs. After considering your income and all the monthly expenses you can always spare out some amount for further investments. A budget may vary from person to person depending on different factors like family income, family size, expenses and lifestyle etc. So, you need not compare it with anyone. Just take into consideration your own personal factors and go ahead with a set budget. ALSO READ What are different Asset Classes - An Overview ! This is the golden rule to be kept in mind. Don’t wait for a particular age to invest. You are in your 20s or 30s go ahead with saving right now. As and when you start earning, the next step is to think of saving money. Each and every piece of saving repays you sooner or later. Remember the piggy bank where you used to put all your savings in your childhood. One fine day when you needed money to get something precious, you used to rush towards it. Similarly, start investing small small amounts as early as possible. One day you will get a lumpsum in return. Remember the equation INCOME-SAVINGS=EXPENSES. This means firstly save then use the remaining for your expenses and not the other way round. You are the one who better knows how to reduce the unnecessary expenditures on luxurious items. Go for basic utility items first and hold your feelings a bit for your luxuries & fantasies. Don’t spend more than what you earn. Avoid excessive use of credit cards and personal loans that usually end up in huge monthly bills. Keep aside an amount to be used for any emergency situation. You can do so by investing in some good saving plans that bear a fixed rate of interest. Such funds are helpful at your retirement as well. You can go in for some short term saving investment plans that don’t have long lockin periods. An emergency fund should be such that you can easily withdraw money, as and when required. So, plan well to have few liquid investments as a part of your portfolio. In India, a part of your income goes to the government in the form of taxes. So, be well versed with the various saving and investment plans and their tax implications. Be clear about the taxability of the interest earned and the maturity amount of various financial instruments. These days various tax free schemes are available, so you have to choose wisely from these options like PPF, Retirement plans, Equity Linked tax saving mutual funds etc. As per the present scenario, one has to himself save funds for his retirement. Gone are the days when parents could rely on their children for their living after retirement. In this changing culture and human values, you should set requisite funds for yourself right now. Invest in some long term health insurance and retirement plans or mutual funds, debt instruments that will benefit you at the time of your retirement. This is the key to getting best returns from your long term investments. You should never choose to invest all your money at one place. Many of us like to keep our money in a savings bank account or only in Fixed Deposits. However, that’s not a fairly wise decision. Plan to have a diversified portfolio that consists of FDs, Mutual funds, health insurance and retirement plans etc. If you don’t want to take much risk you may opt for debt funds that can yield a higher return in the long run. This way you will not block your money in one type of investments and can invest smartly in the various other financial instruments available. In India, majority of people are still hesitant to invest in mutual funds or equity which can yield good returns in the long run. e.g. Investing through SIP( Systematic Investment Plan).is a good practice since a fixed amount will be invested by you every month that will lead to a good corpus amount. This is important because these days many of us are trapped by fraudulent calls and agents. So, be cautious and do your homework as to where your hard earned money is being invested. We as customers have every right to know about where our money is applied and what will be its outcome. Take advise from genuine experts in the field of Financial planning . Finally, if you yourself don’t have the time and knowledge for setting your portfolio, leave it to the financial advisors. These are financially literate people who can advise you in the best possible way with the help of their knowledge and experience. Choose your financial advisor carefully and go ahead to save, invest and grow your money in a planned way. ALSO READ 10 Financial Planning Tips to follow in your 20s ! Moreover, these days various sites and online robo advisors have been launched to help such investors. With these sites and apps you are just a click away from investing your funds in a wise and efficient manner. But, be cautious to invest your hard earned money through good & reliable platforms only. Once you have invested, the task is not yet over for you. Just go in for timely checks so as to see if you have moved in the right direction. Reassess your portfolio after short intervals and see if any changes are required. Have a balanced portfolio comprising of different categories of financial instruments for proper growth of your funds. In the end, it is your money and hence you are the best judge and the one who has to decide on where and how to invest and plan your finances. Others can just help make your ways easy. Whether you are an early bird or a last minute investor, you need to keep these useful investing basics in mind. Good Financial planning at the right time will set a stage for you and your family to take wise economic and personal decisions throughout your lifetime. You can live a better life if your personal finances are planned in a systematic way. Hope you find these financial planning tips or personal finance ideas helpful, the next time you plan to make some wise investments. Make yourself financially aware and develop healthy financial habits, that’s the motive behind our finance blog. Ask your query or Share your opinions on any Financial Topic: Join this Active & Growing Forum!